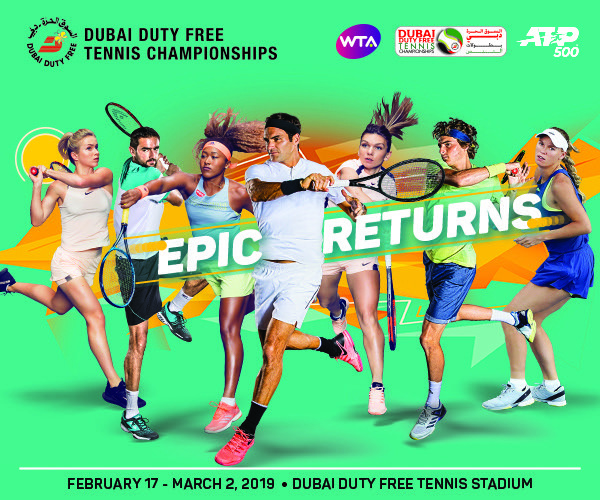 Friday’s semi-finals at the Dubai Duty Free Tennis Championships features seven-time champion Roger Federer, on a quest for his 100th career title, along with three players who each seek a first trip to the Dubai final: No. 5 seed Stefanos Tsitsipas, No. 6 seed Borna Coric, and Gael Monfils. Roger Federer and Borna Coric will face each other for the fifth time in their careers, having split their previous four meetings. Their first meeting came at Dubai in 2015, after Coric defeated No. 3 Andy Murray to reach the semi-finals as an 84th-ranked lucky loser. Federer won that semi-final encounter en route to winning his seventh and most recent Dubai title. They met three times last year, with Coric claiming wins in their last two meetings, including in the final at Halle, where Federer is a nine-time champion. Coric and Federer have each reached their first quarter-final and semi-final of the year this week – for Federer, Dubai is just his second Tour-level event of 2019. As for Coric, he needed to survive final-set tiebreaks in all three of his matches this week to reach the final four. Stefanos Tsitsipas and Gael Monfils square off in the other semi-final. It will be their third meeting, and they have split the previous two, both of which have occurred within the last six months. They each have added to their title counts this month with excellent play on indoor hardcourts: Monfils picked up his eighth career title at Rotterdam two weeks ago and is on an eight-match winning streak, while Tsitsipas won his second career title last week at Marseille and has won seven straight matches. Monfils has been stellar on return this week: he leads all players in percentage of points won returning first-serve (55 of 134, 41%) and return games won (16 of 34, 47%) in the event. Roger Federer is still in the running for his eight Dubai Duty Free Tennis Championships trophy and 100th ATP singles title overall.